Rides on the Wild Side No. 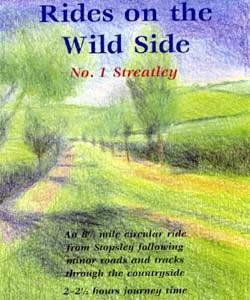 1 Streatley at Streatley Cycle RouteThis is one of a series of short rides through the countryside in South Bedfordshire. It is a circular ride following minor roads and tracks through the countryside. It is possible to start the ride from other points from Warden Hill - see map for details. Start/Finish Point: Start from the junction of the A505 and Butterfield Green Road. Start Nat GR: TL107243. This is one of a series of short rides through the countryside in South Bedfordshire. It is a circular ride following minor roads and tracks through the countryside. It is possible to start the ride from other points from Warden Hill - see map for details. How to get there by car/Parking: From Luton take A505 towards Hitchen , Butterfield Green Road is just before The Vale Cemetery. Parking is available at the start point.